This article is about the NPCs. For the class, see Mythic Dawn Agent (class). Mythic Dawn Agents are members of the Mythic Dawn cult and followers of Mankar Camoran. They are generally non-hostile; however, if you have already completed the quest Dagon Shrine, they will attack you upon sight until Light the Dragonfires is completed. These agents can mostly be found at the secret shrine located within Lake Arrius Caverns; there are some agents who pose as regular townsfolk within several of the cities. These assassins are only encountered during the Tutorial quest and are all males. They wear the typical cultist garb consisting of the Mythic Dawn robe and hood. They also have the chance to be carrying either a random potion and/or gold, and have a unique spell called Mythic Dawn Bound Armor which equips the Mythic Dawn Armor, Mythic Dawn Helm and also allows them to wield a bound mace. These acolytes are encountered in the Lake Arrius Caverns, and are all encountered as Imperials. They wear the typical cultist garb consisting of the Mythic Dawn robe and hood. They also have the chance to be carrying either a random piece of food, an enchanted ring, necklace and/or gold. They also charge into combat with a randomly leveled dagger, shortsword or mace. These agents can be encountered during the tutorial and also upon returning to Weynon Priory. They wear the typical cultist garb consisting of the Mythic Dawn robe and hood, while also carrying randomly generated shoes. Mythic Dawn Agents have the chance of carrying a random ingredient, potion, poison and/or gold. 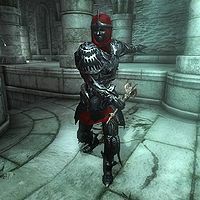 They have a unique spell called Mythic Dawn Bound Armor which equips the Mythic Dawn Armor, Mythic Dawn Helm and also allows them to wield a bound mace. ^aThis Mythic Dawn Agent is encountered dead. These guards are mainly encountered at the shrine situated in the Lake Arrius Caverns. They wear the typical cultist garb consisting of the Mythic Dawn robe and hood, while also wearing randomly generated shoes. 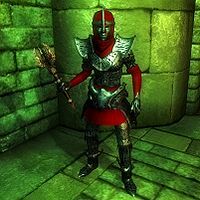 Mythic Dawn Guards also have the chance to be carrying a random poison and/or gold, while most have a unique spell called Mythic Dawn Bound Armor which equips the Mythic Dawn Armor, Mythic Dawn Helm and also allows them to wield a bound mace. ^aThese Mythic Dawn Guards are encountered during the quest, The Path of Dawn. ^bThis Mythic Dawn Guard is encountered dead. 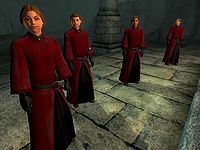 There are also some other variants of Mythic Dawn Agents which do not fall into a specific category, such as the Mythic Dawn Leader and Storeroom Guard. Both can be found at the shrine situated in the Lake Arrius Caverns. They wear the typical cultist garb consisting of the Mythic Dawn robe and hood, while also wearing randomly generated shoes. Both variants have a chance to be carrying some gold, whereas the storeroom guard carries the key to the storeroom and may also carry a leveled scroll. Both also have a unique spell called Mythic Dawn Bound Armor which equips the Mythic Dawn Armor, Mythic Dawn Helm and also allows them to wield a bound mace. Not all Mythic Dawn agents are dressed in the typical cultist garb. A large number walk among the general population across Cyrodiil and are indistinguishable from normal citizens. From there they are able to keep tabs on the goings-on in the cities and help progress the opening of even more Oblivion Gates outside major cities and settlements. However, after the completion of Dagon Shrine, these agents will attack you on sight, until Light the Dragonfires is completed. Astav Wirich Imperial City A Breton agent who appears during the related quest. Cingor Leyawiin A Bosmer agent and also member of the local Fighters Guild. Else God-Hater Skingrad A Nord agent who resides at the local inn in Skingrad. Eugal Belette Chorrol A Breton agent and new resident within the city of Chorrol. Hans Black-Nail Bravil A Nord agent employed as a smith within the halls of Castle Bravil. Isolde Anvil A Redguard agent disguised as a pirate at The Fo'c's'le. Jearl Bruma A Redguard spy who appears during the related quest. Marguerite Diel Imperial City A Breton agent who appears after the related quest. 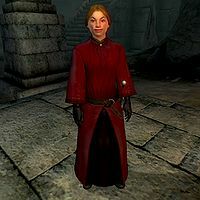 Ranaline Bravil An Altmer agent employed as a cook at The Lonely Suitor Lodge. Saveri Faram Bruma A Dunmer spy who appears during the related quest. Styrbjorn Imperial City A Nord agent who appears after the related quest. Tanasa Arano Cheydinhal A Dunmer agent employed as a charwoman at Riverview. Tolisi Girith Cheydinhal A Dunmer agent employed as a maid at Riverview. Ulen Athram Imperial City A Dunmer agent who hides his secret from even his own wife. Raven Camoran[a] Sunken Sewers, Paradise An Altmer agent, and also the son of Mankar Camoran. Ruma Camoran[b] Lake Arrius Caverns, Paradise An Altmer agent, and also the daughter of Mankar Camoran. Harrow[b] Lake Arrius Caverns A Dunmer agent, and also warden, situated at the Shrine of Dagon. Doorkeeper Lake Arrius Caverns An Imperial agent stationed outside the Mythic Dawn headquarters. Eldamil[c] Paradise An Altmer agent, and former chief lieutenant, in the Forbidden Grotto. ^aWill attack on sight unless you choose to meet the sponsor yourself. ^bWill not attack unless you release the prisoner or Steal the Mysterium Xarxes in the Dagon Shrine quest. ^cWill help you out during the quest Paradise. The Path of Dawn: You must return to Baurus in the Imperial City to try to track down the stolen Amulet of Kings. The Mythic Dawn agents attack due to a 100 point faction-wide decrease in disposition when you steal the Mysterium Xarxes. At the end of the quest, Light the Dragonfires, the disposition drop is reversed. Therefore, any agents who survive the main quest will no longer be hostile. Using a combination of Charm, Speechcraft, and/or 100% Chameleon, you can raise an agent's disposition to prevent them from attacking you. Conversely, by deliberately lowering their disposition you can provoke these agents to attack you well before stealing the Mysterium Xarxes. You may also encounter trouble with the sleeper agents before the quest, Dagon Shrine. 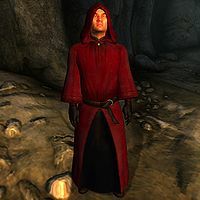 If you traveling to Cloud Ruler Temple with both Martin and Jauffre during the Weynon Priory quest and you enter a town where a Mythic Dawn sleeper agent is located, they may attack and kill the agent. It is possible to identify the sleeper agents before completion of Dagon Shrine. Generally agents have some Mythic Dawn paraphernalia in their house, such as a robe or one of the Mythic Dawn Commentaries volumes. If you leave Lake Arrius Caverns immediately after talking to the doorkeeper, and engage conversation with a townsperson who is an agent, they will say "Greet the new day, brother/sister", but will still have the normal dialogue options available.